Horological Times is the only monthly U.S. magazine reaching the watch maker, clock maker, and the industries that serve them. It’s a cost-effective, valuable tool for your marketing and promotion. Horological Times reaches 2,500+ horology professionals in the U.S. and across the globe. 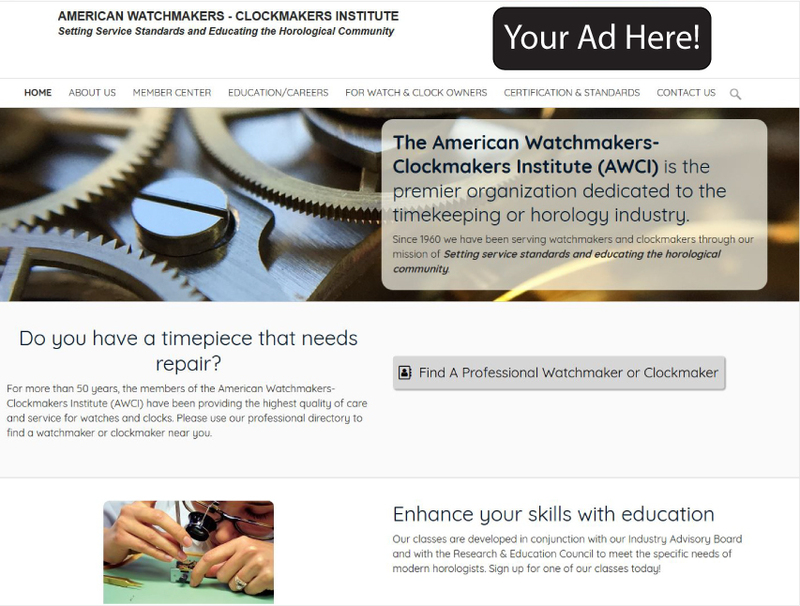 Maximize your exposure to the clock and watch repair businesses that use your material, equipment and services every day. Web Advertising banners sold in increments of 3-months minimum: 360 x 95 pixels. Viewers will be able to click on your ad to view your website (must provide link to your website). Call for other discounts on longer-term web ad schedules. More than 33 years of history! AWCI Members can view the archives of Horological Times online by clicking here. Members and Non-Members alike can own the archive collection 1977-2009 on DVD by purchasing it through our online store. 12x Frequency Advertisers: For topics of interest to our readers, we will consult with you to develop an article about your business, products or industry during the year of your advertising schedule. Rates: $1.10 per word. Classified Display Ads: $47.50 per col. inch. NOTE: 3-month minimum schedule. To place an ad contact: editor@awci.com. Have news or a story of interest to our readers? Click here to contact the editor. Want to be a Contributing Author?